Beautiful house on the unspoilt SE coast of Barbados. Bougan Villa is a lovely house with private pool situated in a small development in Bottom Bay on the unspoilt SE coast of Barbados. The house has been finished to a high standard and has recently been redecorated throughout. The villa has all the accommodation and facilities needed to ensure that visitors have an amazing holiday on this beautiful island. The well equipped kitchen contains all you need to prepare a six course banquet or a simple G&T! There is a large oven with electric grill and hob, a large fridge freezer with water and ice dispenser and a microwave. There is ample crockery, cutlery and utensils and also a coffee machine, a 4 x toaster and Ninja blender. The separate dining room is beautifully decorated and has a ceiling fan and bi-fold doors leading out onto the covered terrace. Bougan Villa is one of the only properties on the Atlantic Rising development that has a separate dining room. If you prefer to eat al fresco there is also a dining table and chairs on the roof terrace. The bedrooms are both air conditioned and have their own bathrooms. The master bedroom has a walk-in wardrobe and en suite and the second bedroom has large fitted wardrobes with ample storage. There are also fans available for both bedrooms. The comfortable lounge has two large sofas, two ceiling fans and a large flat screen TV with satellite channels. There are plenty of books and also games for guests' use. The inside living area is comfortable, light and airy and leads out onto the shady extended terrace which is perfect for lazy days overlooking the private pool and lawned garden. The palm trees provide for shady al fresco dining on the roof terrace and the views from the roof terrace of the nearby ocean are wonderful... the perfect place to enjoy the sun rise or set. 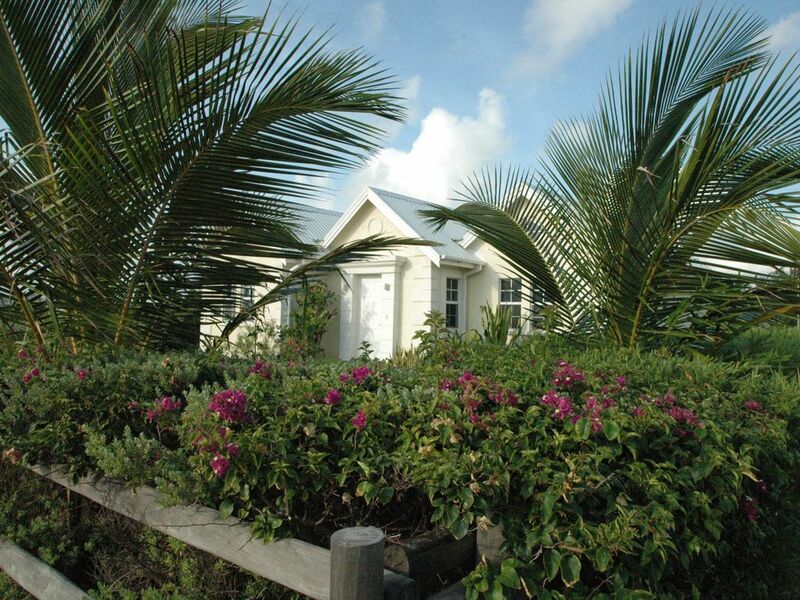 There is free WiFi throughout the villa and the use of a telephone for free calls within Barbados. The Atlantic breeze on this side of the island means that even on the hottest days the temperatures are comfortable. Bottom Bay beach (voted as being in The Times' and Conde Nast's top-ten best beaches in the world) with its white sands and coconut palms is 3 minutes amble away. Harrismith, Palmetto and Long Bay (our personal favourite) are also stunning beaches which are just a short stroll. For less confident swimmers the Northern end of Long Bay has a very calm swimming area (see photographs). For those of you looking for exciting night life and fine dining, the busier South and West coasts are a brief car/taxi/bus ride away. For the surfers amongst you a trip to the legendary Soup Bowl at Bathsheba on the East coast is a must, and is only 20 minutes drive away. See our great reviews on TripAdvisor! Both bathrooms are fully tiled with modern suites and fittings. Bathroom towels are supplied. A/C in bedrooms. Ceiling fans in lounge and on terrace. Bathroom towels supplied, please bring your own pool/beach towels. Highchair can be hired from housekeeper. There is free WiFi throughout the villa and the use of a telephone for free calls within Barbados - perfect for booking those restaurants or day trips! Bed linen, bathroom and kitchen towels are provided. Please bring your own beach towels. High chair and cot can be hired from our housekeeper subject to availability. The kitchen is equipped with ample crockery, cutlery, pots, pans and utensils. There is a large oven with easy clean ceramic hob and grill, and the large fridge freezer has an integral water and ice dispenser. There is an LCD flat screen TV with satellite channels. Our housekeeper who lives nearby will meet you on arrival at the house and is on call for questions and queries 24 hours a day 7 days a week. The villa was lovely and provided what we needed during our stay. You definitely need a car as it is based in a remote area and having transport made it easier to access areas. Although we didn't spend a lot of time at the villa as we were out and about , when we did it was nice to chill by the pool both early morning and on an evening. Bottom bay beach is walking distance but I wouldnt recommend swimming there as the sea is choppy, nearby shark hole is a gem of a place. Jan was helpful and attended to any issues promptly. No hesitation to re-book or recommend to others! Great place. We booked Bougan Villa for a month to spend a little time away from our winter. Having never been to Barbados before we had to rely on online posts and descriptions to choose a place. After much browsing through many sites we found Bougan Villa. It seemed to fill all of our requirements, a quiet, relaxing, comfortable place where we could live for the duration. We were not looking for the all inclusive type of experience, no need for the crowds, line ups and entertainment. Bougan Villa is located in a quiet residential area, away from the crowds and traffic of the highly populated west coast area. Instead, Bougan Villa provides a very relaxing, well maintained space with nice open access to the patio, yard and pool. Sun and warmth when we wanted it, a nice shaded lounging area with an overhead fan when we felt like it. The photos provided are accurate so we didn’t find any surprises when we arrived, as sometimes happens. Our arrival was delayed but the property manager Jan was waiting for us on our arrival and gave us a quick but thorough introduction. During the first couple of days we had a couple of minor issues and Jan dealt with them immediately. So overall, we were very happy with this house and our stay. A couple of things to be aware of, as stated Bougan Villa is quite a ways from most commercial venues including basic living necessities so a car is required. (you could use cabs for a short term stay) The ocean is near by with several beautiful beach but be aware that swimming at these beaches is not recommended for good reason. Onshore winds are constant around Bottom Bay which keeps the humidity and temperatures at very nice levels but the surf was always too much to go into the ocean. Swimable beaches require driving. The upside of the constant breezes is that we did not need air conditioning once during the month we stayed! Also, the bbq is a charcoal grill that needs some upkeep. I did a few minor repairs and we used it many times. For those of you who are accustomed to gas grills, be prepared, life is slower in in the islands. My final comment, (please note, I have no complaints) would be regarding the beds. My wife and I are both quite tall and being from North America where queen and king sized beds are the norm, we found a double to be quite short. Overall, and excellent choice for a quiet stay! Our whole experience dealing with the owner, Nicola and the property manager Jan was A1. Great Place By the Beach! We stayed for 10 days at the lovely villa with our two boys (age 5 and 7). Upon arrival, we were greeted and some light groceries were already done for us. Suffice to say, this place is bare. I was a bit surprised as I have done other Home Away places and usually they have sugar, salt and spices. But this place is literally all empty so you will need to buy everything if you plan on cooking like I did. The pool was great, we had a bit of an issue in the beginning but it was all good to go by the third day and my kids loved it. The pool is a bit small. But regardless, its a great place to cool off. The beach was a short walk away. When we were there, there was enormous amount of seaweed. The waves are very strong as well. The boys played in the sand mostly. However, the best beaches are a drive away and we strongly recommend renting a car. Over the place was great! We had a great time! Truly, lovely property! Spent 10 days in Aug/Sept, and has everything you might need to ensure you have a comfortable stay. The pool is the icing on a rather delicious cake - perfect for cooling down on a hot day! Thanks to Jan for helping make our holiday a particularly enjoyable one. Thanks for your positive review, we're glad that you enjoyed your stay. There are several beaches within walking distance of the villa, the nearest being beautiful Bottom Bay - a few minutes walk from the villa. If you prefer a calmer sea then Sam Lord's Beach is for you, it is just 15 minutes on foot from the villa. The Northern end of the beach is protected by a natural wall of rocks meaning that the water is very calm and is therefore perfect for less confident swimmers. The water is crystal clear, the sand is white and in our opinion it is the best beach in the world! Bottom Bay beach (voted as being in The Times' and Conde Nast's top-ten best beaches in the world) with its white sands and coconut palms is 3 minutes amble away. Harrismith, Palmetto and Long Bay are also stunning beaches which are just a short stroll. The gentle Atlantic breeze on this side of the island means that even on the hottest days the temperatures are comfortable. The local speciality, rum, is very cheap on the island, and there are many types – the Four Square distillery is very close by and is great to visit. Rum shacks are everywhere on the island, and are quite an experience! When it comes to dining, you are spoilt for choice in Barbados. Some of the best restaurants in the Caribbean (and some suggest the world!) are a short drive away. There are sailing and helicopter trips departing daily from Bridgetown and diving, surfing and kite-surfing enthusiasts will be kept busy. Bottom Bay residential area is a peaceful location but just 5 minutes drive away is the Six Roads Shopping Complex with bank, post office, supermarket, fast-food restaurant and other retail outlets. Lendee's local grill bar (delicious food) is just a 10 min walk and East Point Grill with its great food and amazing views is just 5 mins in the car. Oistins is just a 20 min drive away and St Lawrence Gap, with its very busy nightlife, just 25 mins. There are many taxi services on the island and they are not expensive so getting around after a night out is not a problem! A 25% deposit and completed booking form is required to secure the booking. The remainder is due 8 weeks before the start of the holiday. Check-in is 4pm onwards and check-out is by 11am. Bathroom towels are provided but please take your own pool/beach towels.